Chong Qing, our beautiful private dining space, offers the perfect location for a special occasion. 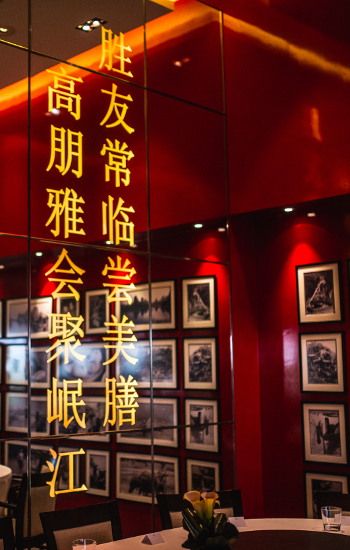 Chong Qing’s interior possesses a contemporary influence throughout; with deep reds, mirrored walls and high ceilings, creating an authentic atmosphere for our guests to enjoy. The room can seat up to 20 people and is an excellent venue for private events and celebrations. Chong Qing retains views of Hyde Park and the skyline beyond through the mirrors that line the walls. Available for lunch and dinner, our experienced and devoted staff will ensure that it is an occasion to remember. Our set menus start from £40 per person for lunch or £68 per person for dinner. Are you celebrating a special occasion? Recieve a glass of champagne on arrival and a special celebratory cake for an additional £15 per person. To see our full menu selection, go to the MENUS section. For bookings, more information, or to arrange a viewing, please contact us on privatedining@minjiang.co.uk or call 020 7361 1999.